Search. Add to Cart. Checkout. “Your [insert item name here] will arrive in 2 days!” In a digital world, we can do almost all of our shopping with the click of a button. Depending on what site you shop from, you may not even have to pay sales tax! However, what seems like a lucky break to online consumers is soon going to pose a major question in Congress following the recently argued Supreme Court Case South Dakota v. Wayfair, Inc. In a digital world, we can do almost all of our shopping with the click of a button. Depending on what site you shop from, you may not even have to pay sales tax! However, what seems like a lucky break to online consumers is soon going to pose a major question in Congress following the recently argued Supreme Court Case South Dakota v. Wayfair, Inc.
Nearly 25 years after the Quill ruling, South Dakota tried to implement a law specifically to override the precedent that the state believed was preventing an additional tax revenue of potentially more than $8 billion, according to the New York Times. In 2016, the Mount Rushmore State enacted a law that requires all retailers whose annual sales within the state exceed $100,000 to pay a 4.5 percent tax on purchases. However, to a certain extent, the state’s plan backfired: major internet retailers, in particular Wayfair, Inc., Overstock.com, and Newegg, failed to pay the newly instated tax. Despite having a physical presence in other states nationwide, none of the three large companies have a physical presence in South Dakota. 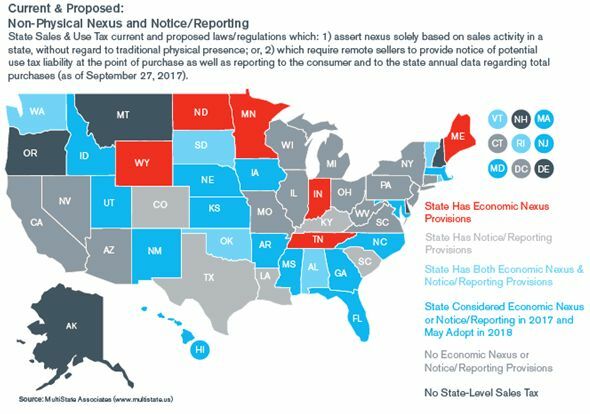 Therefore, they continued to not charge sales tax for in-state sales, according to Bloomberg Politics. Shortly thereafter, their disregard for the tax prompted South Dakota to sue the three major retailers for violating the law. After passing through the state courts, on April 17, 2018, the case South Dakota v. Wayfair, Inc. was argued before the nation’s highest judicial bench: The Supreme Court. Although this case may seem like it falls within the jurisdiction of the Supreme Court to determine the constitutionality of the South Dakota law, the sitting justices question if this case is better left to the hands of the legislature. According to the New York Times, justice Sonia Sotomayor asked if the Court could somehow “signal” to Congress to act “more affirmatively” in regard to interstate and online retail tax law. Justice Sotomayor also brought up how this case introduces a “host of questions,” one of which is argued by South Dakota’s attorney general Marty J. Jackley (NY Times). Jackley discusses the importance of physical presence in the digital age, seemingly echoing the commentary of justice John Paul Stevens from Quill v. North Dakota back in 1992. Justice Stevens wrote for the majority opinion, explaining that “the physical-presence requirement, despite its ‘artificiality,’ provided a clear standard for applying the dormant commerce clause” (Bloomberg). Jackley rejects Justice Stevens’ conclusion from Quill, going even further into details of digital commerce by explaining how today’s technology would actually make calculating state and local taxes fairly easy for any online retailer (NY Times). Though the Supreme Court ruling on South Dakota v. Wayfair will have its repercussions, the more interesting results will be found in the legislature. Chief Justice John Roberts and Justice Elena Kagan both suggest that Congress’s lack of action regarding interstate sales tax for online retailers could be a sign that Congress is satisfied with the current situation. After all, it has been 26 years since this issue was first openly acknowledged, and nothing has changed since then. However, rather than reveal a legislative satisfaction with current policy, I think that Congress has been hibernating and avoiding the frigid debate that is monitoring a state tax at the federal level. The federal tax code by itself already has very few changes due to partisan disagreement and lack of compromise. 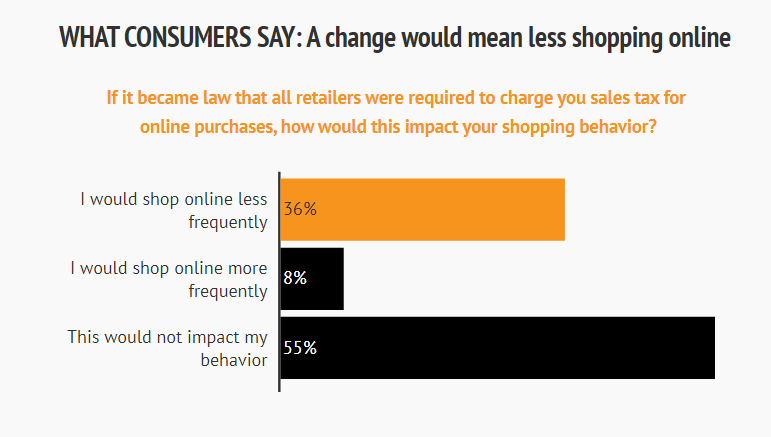 Frankly, in addition to raising a federalist argument, regulating interstate online sales tax law would introduce another level of confusion to the debate: the internet. Online sales incorporate the unprecedented, seemingly infinite span of the internet, which blurs traditional state (and even federal) boundaries, let alone local jurisdictions. I believe this tax has two future pathways: (1) national implementation of a sales tax for all online retailers regardless of in-state presence; or (2) regulations on in-state presence remain the same without generalizing sales tax. Given the popularity of solely online retailers such as Amazon and the growth of online sales for physical stores such as Wal-Mart, any exploitation of physical-presence requirements could create major problems for local and state tax revenue. In this case, a nationally imposed sales tax standard regardless of physical presence would prevent companies, especially large corporations, from unreasonably avoiding paying sales taxes. On the other hand, leaving the physical presence requirement in place will help protect small online retailers who are being forced to compete with larger corporations. Small businesses in the United States are a certain kind of “endangered species,” and as originally cited in the Quill ruling, a nationally imposed tax regardless of physical presence could imbue upon these smaller companies an undue economic stress. In the long run, the disappearance of small businesses in favor of large corporations could hurt our economy and eliminate the capitalist core of the “American Dream” in which any man can create and live off of his own business.